The L.A. Colors section of my Dollar Tree used to be a section I'd pass over without much thought. It was usually a handful of unoriginal or not so great colors. Lately, the Dollar Tree nearest to me has been out a fairly large selection of L.A. Colors polishes and has been rotating the colors seasonally. I came across this beauty a few weeks ago and it's a real winner. 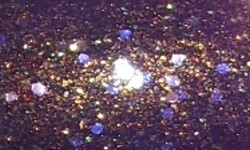 Treasure Chest is a blue-toned purple with an intense gold glass fleck sparkle and some silver round glitters. Color: The finish of this polish reminds me of the polishes in the Zoya Sunshine collection 5 years ago. They're intense flecky shimmers if that makes sense. I love this finish and I adore this color. 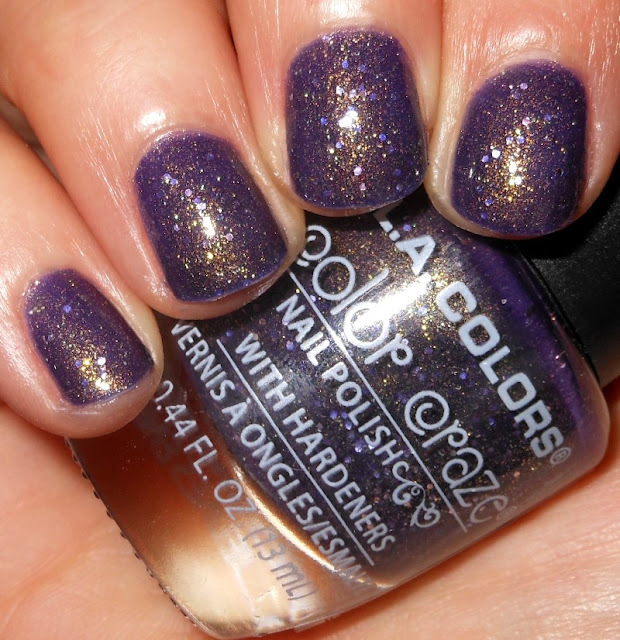 It's an intense purple shade and all of that golden and glitter magic make this polish super special. Formula: This had an excellent formula I used 2 coats above. Price: I paid $1 for this at Dollar Tree. I do not see this color come up on the L.A. Colors website so I'm wondering if this is an exclusive to Dollar Tree? Overall: This polish is pretty fantastic. The finish and color are beautiful and this is a polish I'd expect to pay more than $1 for. You really can't go wrong here in any way. This is a winning polish for several obvious reasons!